The occult isn’t a new subject played out on record; indeed many an artist has dabbled in the dark arts and covered it on many a release. Discovering Fabio Fabor, who by his own self -proclamations works within a “Dante-esque environment”, introduces the listener to yet another completely batshit insane artist to display his works on the Plastica Marella label. Obscure B-Movie horror keyboards that wouldn’t be out of place on any 70’s British Hammer/Amicus classic; if anything else, feel heart-warming and familiar. The relevance of such music nowadays does ask a lot when listening to this album, but luckily there are momentary lapses in the psychedelic nonsense to appreciate just what Fabor is trying to achieve, when things quieten down a notch and some of the grittier ambient is allowed to gain prominence. Overall, whilst being one of those oddities that I relish being in my collection (if not just for the blood splattered clear vinyl alone), this electroacoustic, esoteric mash up of disjointed mental states is difficult to swallow in its entirety. 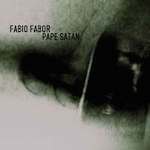 One of the more eclectic releases I have heard in some time, I appreciate the lucid states that Fabio must have got himself into to record this; and fair play to him if anyone else can lap this up, even if I struggled somewhat.